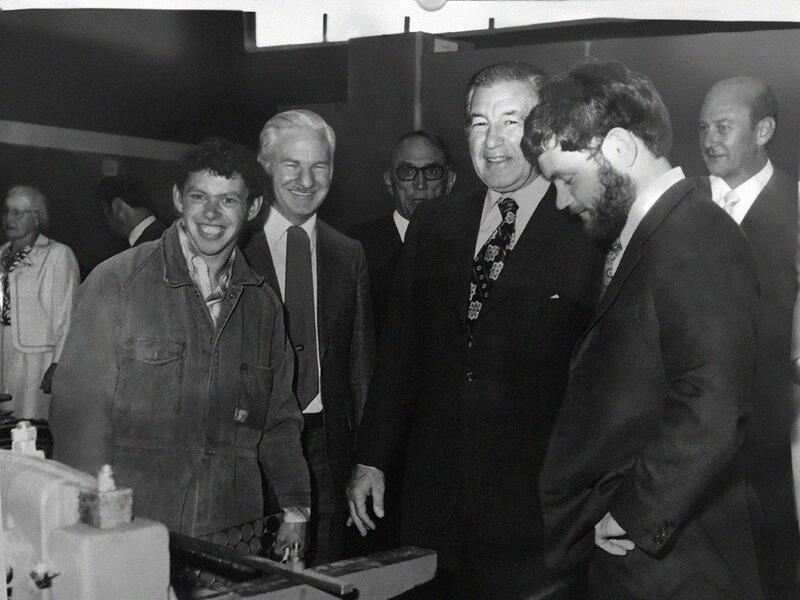 Edgar William Rainbow left school as soon as he turned 14 and worked in various workshops until 18 years old when he was called up for Military Service, in which he served but did not leave Australia. 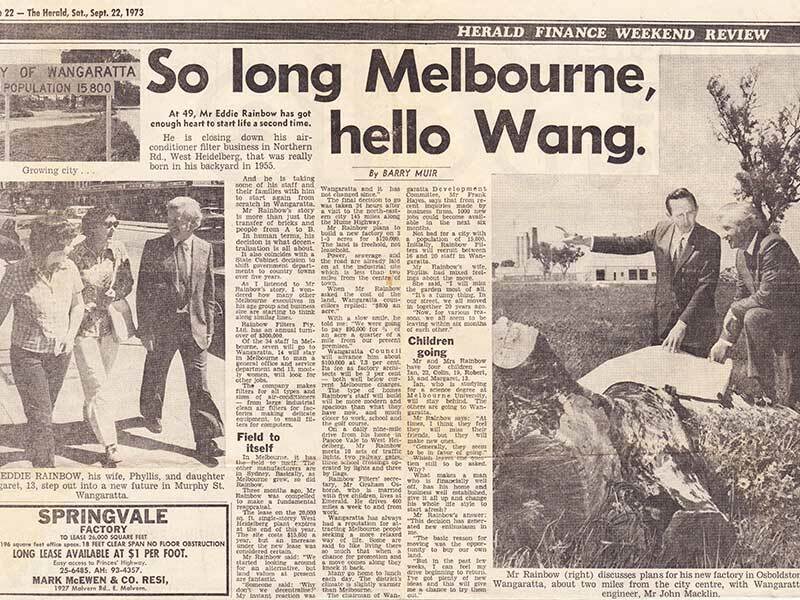 He was then able to join the RAAF where he trained as a pilot. 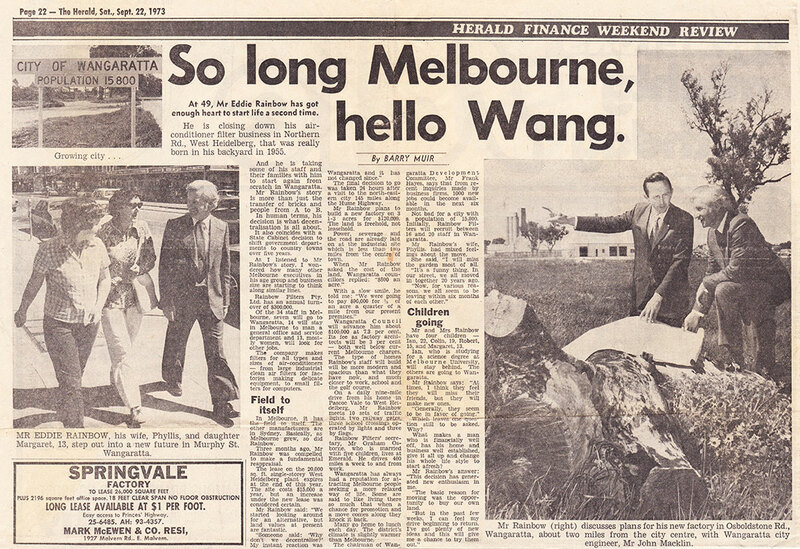 War finished at about that time and he was discharged. Eddie then took advantage of further education and joined Swinburne Tech where he completed a Mechanical Course. He then worked at the Metrology Labs for a couple of years and then joined Carrier Air-conditioning where he studied air-conditioning. 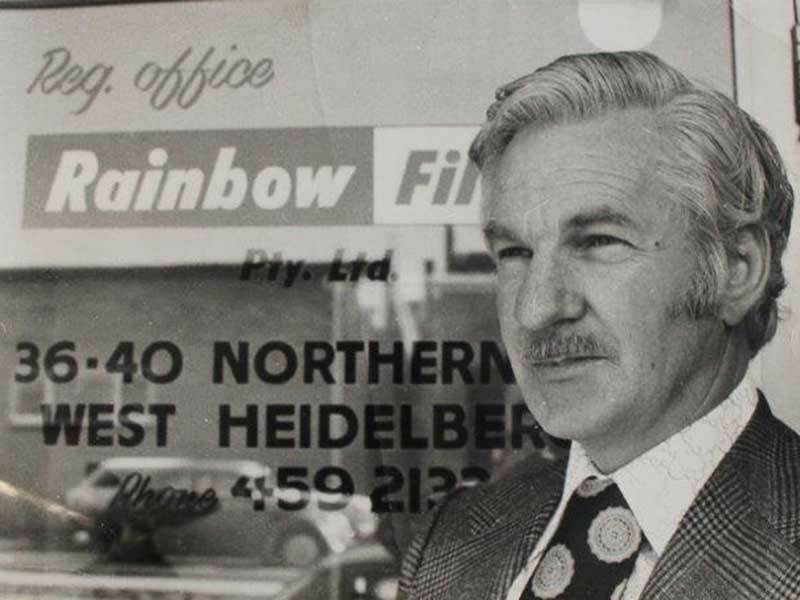 After a few years gaining experience in business, and after Carrier decided to cease filter cleaning and maintenance, Eddie decided in 1955 to embark on setting up in a small way his own business. 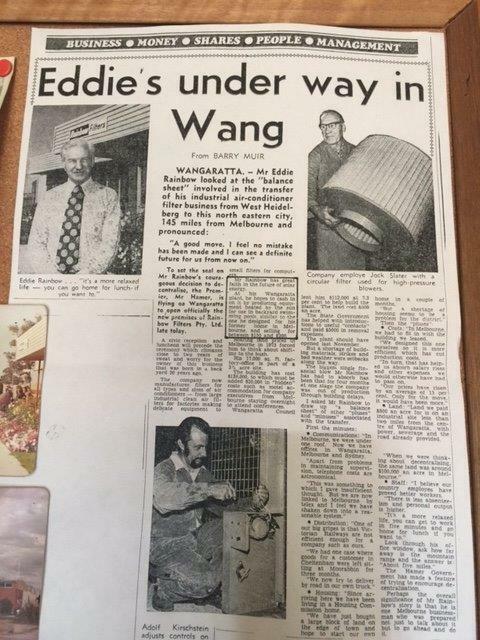 First he bought a second hand standard Vanguard Panel van, he collected dirty filters, washed them in detergent, hosed them in the backyard with the garden hose and when applicable sprayed them with oil, used the household vacuum cleaner reverse action too, before returning them at the next service. 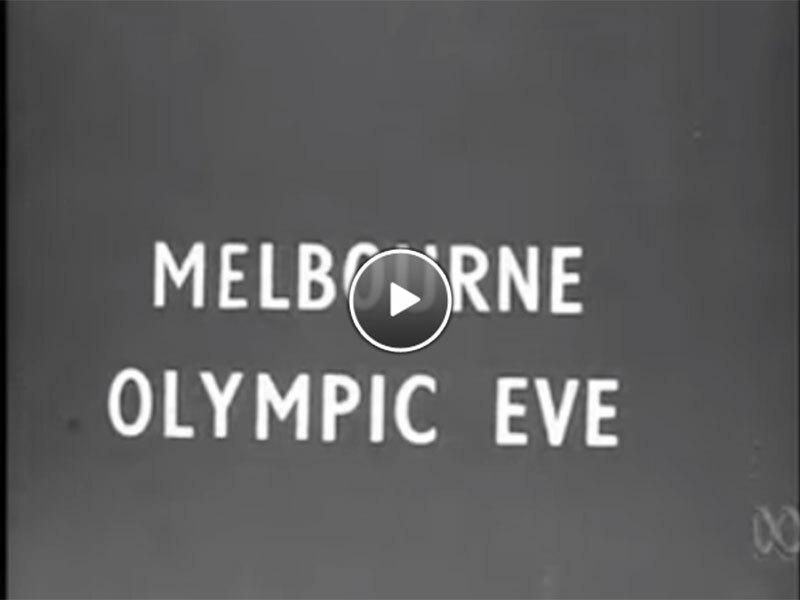 This, at the same time Melbourne hosted the Olympic games, was the beginning of Rainbow Filters in 1956. As the work increased and the noise was raising comment from an occasional neighbour another site was found at Percy Street, West Heidelberg. 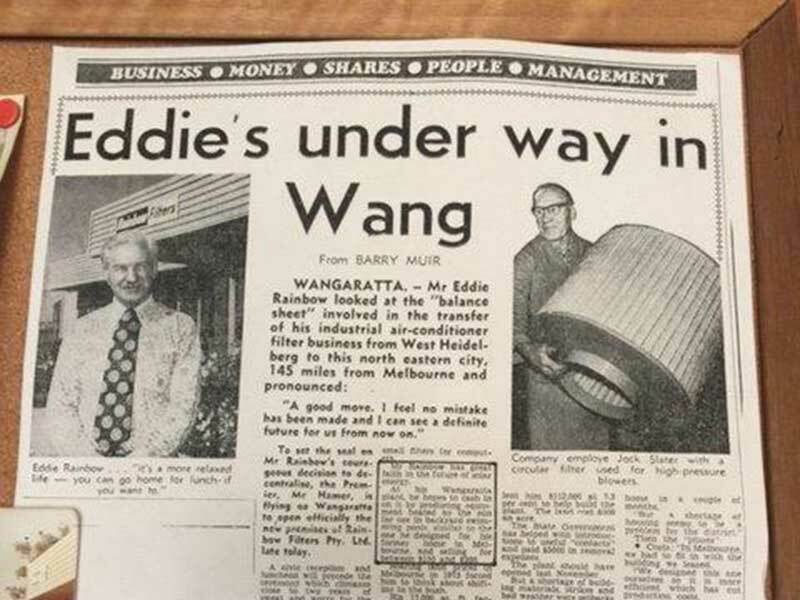 It was here that manufacturing filters really started and grew, larger premises were required and Eddie moved to Northern Road, West Heidelberg with a 5 year lease. 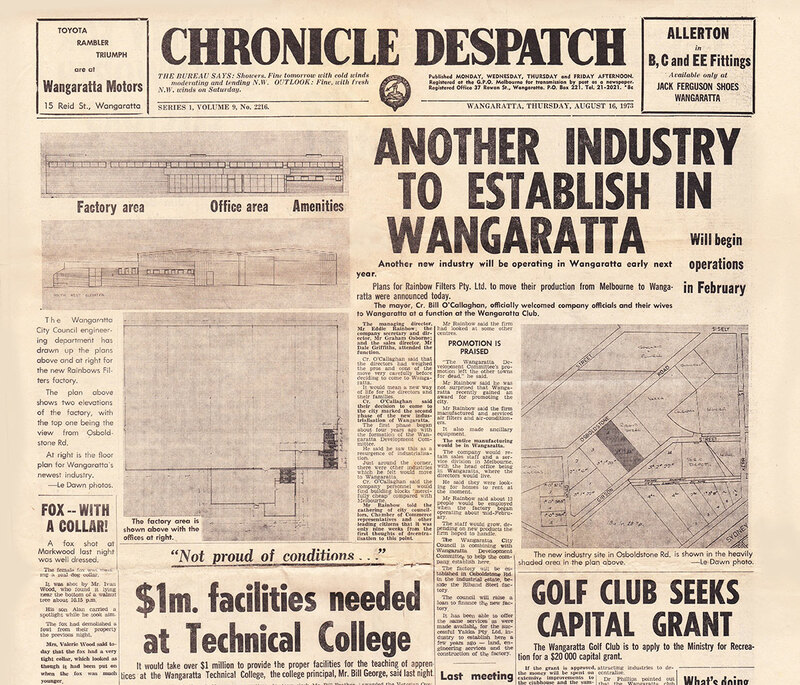 As the lease rate was going to increase greatly it was decided to move, a suggestion to inquire about ‘decentralisation’ was made and the result Wangaratta was the new home for Eddie, wife Phyllis and their 4 children. 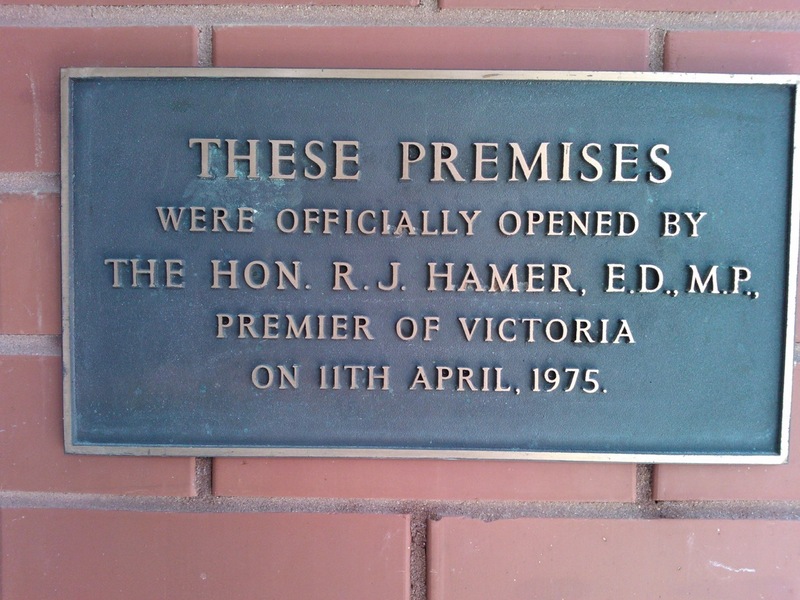 In January 1974, the Hamer Government were very supportive and helped with moving costs etc. 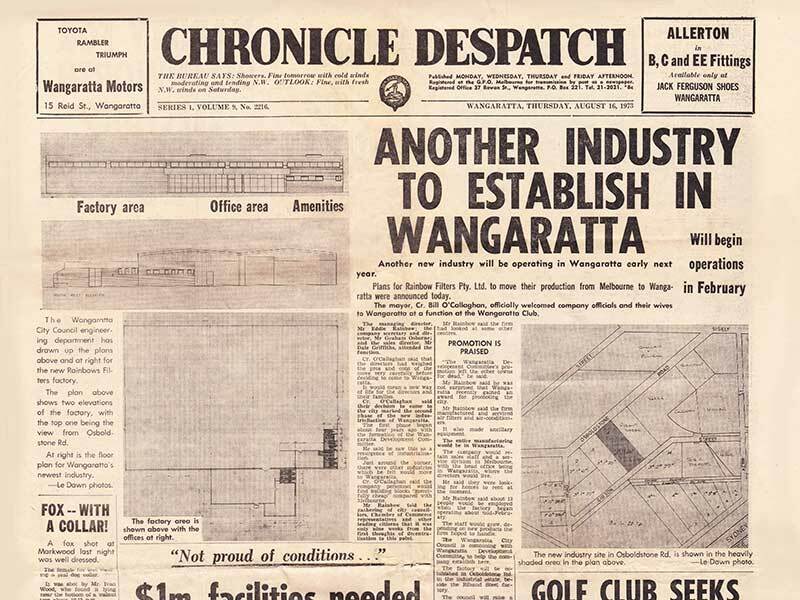 The service section and sales office remained at West Heidelberg. 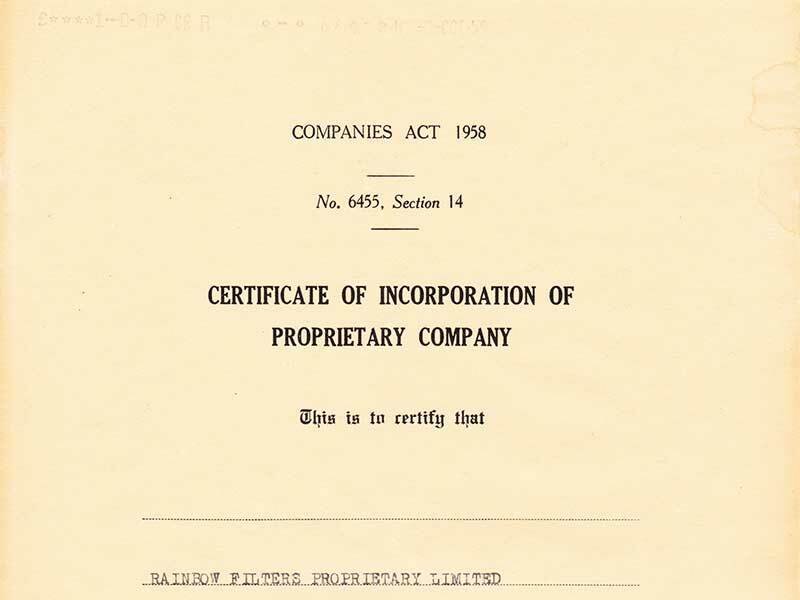 Manufacturing commenced in April 1974 where it still remains operative today. 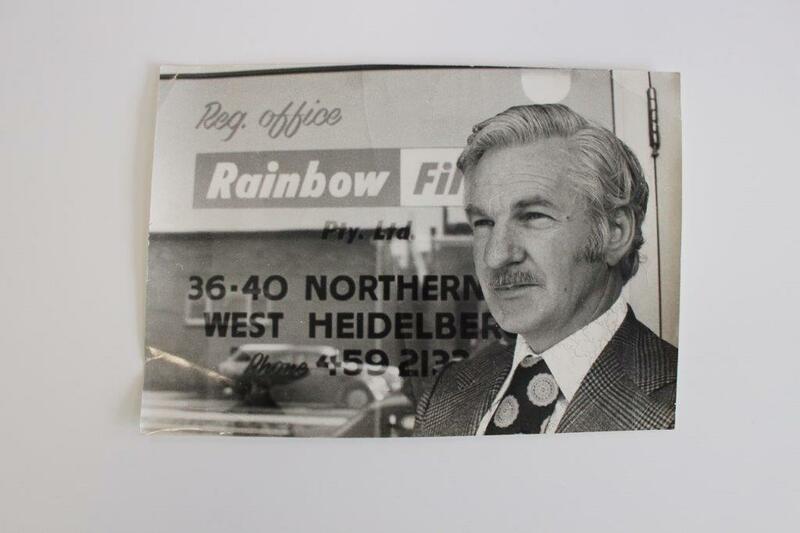 In 2000, Eddie contacted Mike Pavey, who was working in the industry and asked if he was interested in working with him with the view to purchase Rainbow Filters. 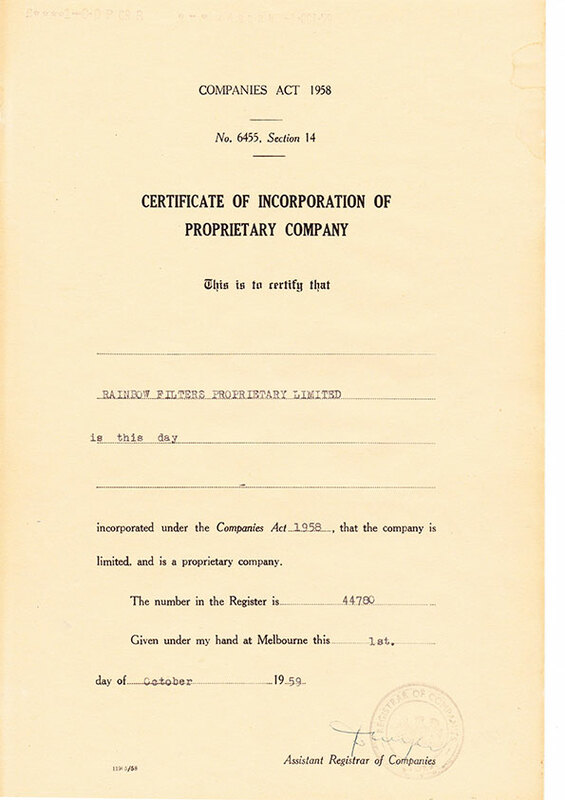 He did so and purchased the business in June 2002. 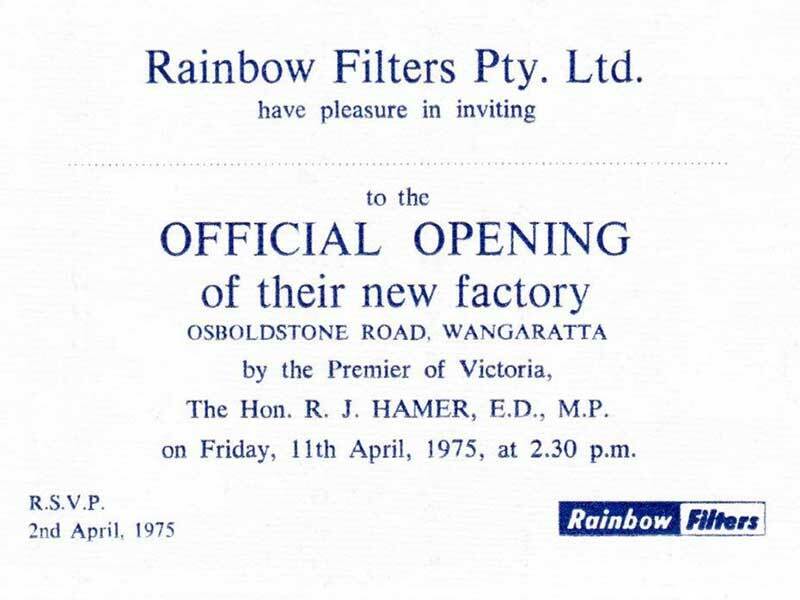 Rainbow Filters run the sales office at Bayswater and have a state office in Cabramatta NSW, appointed distributors in Perth, Darwin and Launceston. 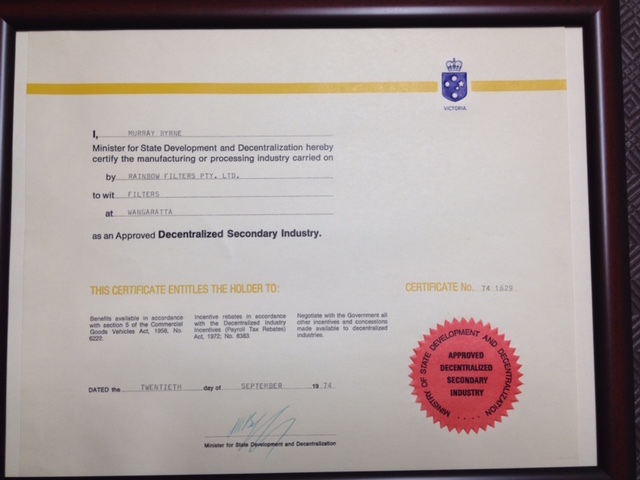 Rainbow Filters recently acquired AG&G Services, a cleanroom testing business. 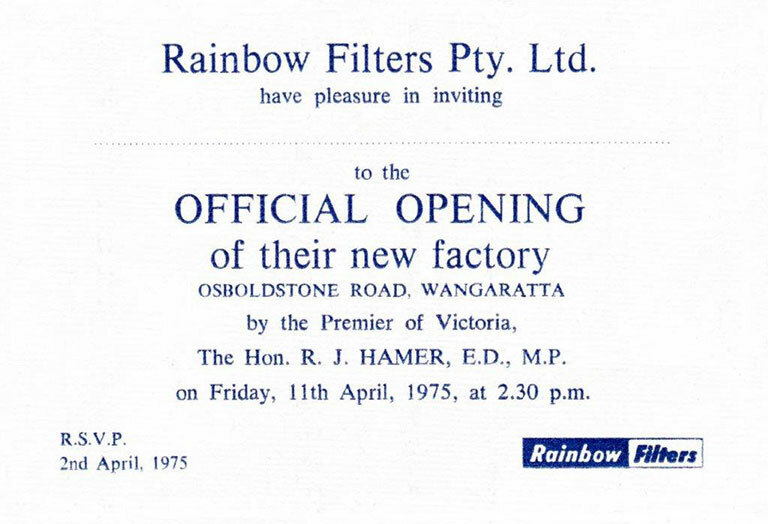 Rainbow Filters has been a member of Australian Industry Group since 1957.